Swildon’s Hole in1934. L-R: Jack Sheppard, “Jumbo” Baker, Graham Balcombe, Charles “Digger” Harris, B. Offer, P. Brown, Bill Tucknott. Photo: Frank Frost. 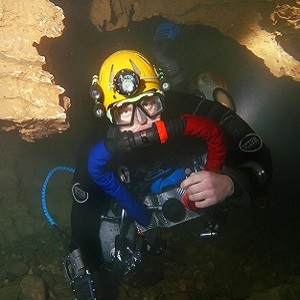 Cave diving in the United Kingdom did not originate or develop in isolation from caving. Cavers learnt to dive; cave divers did not become cavers. It was regarded simply as another technique to further cave exploration. Just as a ladder or rope is used to overcome a vertical drop, so diving equipment was used to overcome a flooded passage. Being underground and underwater doubled the skills to be mastered by the pioneers, so with the additional problem of equipment that was in its infancy, the dangers confronting the first cave divers were incalculable. No manuals were available to educate the uninitiated and no organised cave rescue teams existed at the time should anything go wrong. Those participating were on their own. The early history of cave diving reveals the independent outlook needed by those involved. By modern standards their progress was slow but sure. In the 1930s and 1940s it took many years merely to explore and pass the sump between Chambers 3 and 9 in Wookey Hole, now a regular training dive. The equipment was in its infancy and the fears and mental obstacles that existed were far different from what they are today. Any step forward in those days measured up to any advance achieved today. In France, the Fontaine de Vaucluse was reconnoitred by a diver on an air line to –23m in 1878, in 1893 a Swiss diver with equipment made a 15m penetration in a cave, and in 1894 a diver with equipment valiantly tried to assist in the rescue of a trapped caver also in Switzerland. Norbert Casteret made his now celebrated free-dive through a sump in Montespan in 1922. But the moment cave diving was really conceived came when cavers carried a respirator underground and succeeded in breathing underwater to explore a virgin sump. Swildon’s Hole, a cave in the Mendip Hills of Somerset, England is one of the world’s cradles for cave diving as well as the Birthing Pool of the Cave Diving Group. Its exploration, which began in the early years of the 20th century, terminated at a pool of water, variously termed a Syphon, Trap or Sump. Cavers in many countries have tried to pass these barriers in a variety of ways; using the simple “free dive” with a lungful of air or by utilising the available diving technology of the day. Two Post Office engineers, F.G. Balcombe and J.A. Sheppard who were among the leading climbers and cavers of their era, combined their energies into solving the problem of passing the Swildon’s sump. Their pioneering dive on the 17th February, 1934 used a home-made respirator, designed by F.G.B, that incorporated part of a ladies bicycle frame. The attempt was unsuccessful but the foundation of Cave Diving in the U.K. had been laid. The team returned to Swildon’s Hole on the 4th October, 1936 with Jack Sheppard’s newly designed apparatus (nicknamed “Jimmy”. It was base fed by a football inflation pump that was coupled to a home-made dry-suit that incorporated lighting and a telephone. This was used by J.A.S. to pass sump l. Later that year the bicycle respirator became self-contained with the addition of an oxygen cylinder. In turn F.G.B.dived solo through sump 1 and found the air chambers of Sump 2. These pioneers established the pattern of U.K. cave diving; the systematic exploration of a cave system in its phreas by diving both the resurgence and its tributaries. Penelope “Mossy” Powell & Graham Balcombe at Wookey Hole in 1935. After the Swildon’s dive in 1934, Balcombe approached the long established diving company Seibe Gorman for assistance. This firm was in the forefront of designing and building respirators for use in mines with bad air, in flooded tunnels and at sea for submariners in particular. Sir Robert Henry Davis, who started work for Seibe Gorman in 1882 and had been its managing director since 1904, responded favourably. Jack Sheppard visited him and, grateful for any equipment to further cave diving, accepted Sir Robert’s generous offer of standard helmets and diving dress fed by air lines from hand pumps. Sir Robert also agreed to provide an experienced diver to train those wanting to learn, and the pools at Priddy Mineries were chosen as “base camp”. The sheer bulk of all the helmet diving gear forced the pioneers to focus attention on the roomy and easily accessible Wookey Hole Caves throughout 1935. It was an accident that resulted in a success story. The excitement and rewards of that summer are best gleaned from The Log of the Wookey Hole Expedition, 1935, by The Divers. This now classic book of cave diving history was written and produced largely by Graham Balcombe during the following months. From a diving base in the Third Chamber his team progressed beyond the already known Fourth Chamber and entered new Fifth, Sixth and Seventh Chambers. Being restrained by base-fed air lines and weighted for bottom walking, they were restricted and unable to travel more than 61m. But the way on was tantalisingly wide open; cave diving had a promising future. Wookey Hole Caves are thus regarded as the birthplace of cave diving. 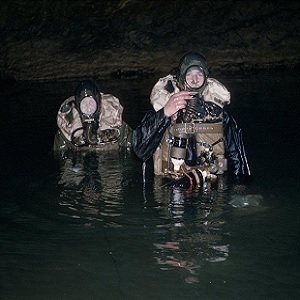 In the years following the Second World War, the River Axe became the cradle of the Cave Diving Group. 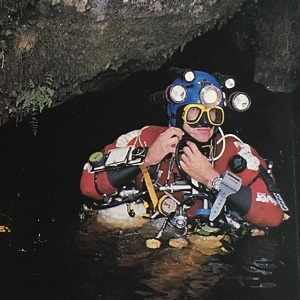 The 1935 expedition and the nature of Wookey Hole’s commodious sumps set the standards for years to come – safe-water training, kit testing, meticulous log keeping, good lighting, line laying, navigating, surveying, and the accurate recording of every dive became rules. Porters (or sherpas), dressers, photographers and a controller were needed. Bottom walking ruled, for the need to swim, let alone the opportunity, had simply not arisen. Another aspect of the early days at Wookey Hole that considerably influenced later cave diving was the need to fit in with the owner’s requirements since the cave was, after all, a major tourist attraction. In fair return, the cave owner expected full media coverage of any discoveries. Some cave divers learned to perfect the art of publicity themselves and it is fundamental to the larger expeditions of today. But the preferred outlook that still appeals to many cave explorers is the unsung pushing of a streamway in the independent manner shown by Balcombe and Sheppard down Swildon’s Hole. One of the divers was Penelope “Mossy” Powell who wrote in the expedition log: “The first trip up the bed of the river Axe is a revelation of the beauties of this underwater world. It is almost impossible to describe the feeling as leaving the surface and the dazzling glare of the powerful lights, and slipping dow from the enveloping brown atmosphere, we suddenly entered an utterly different world, a world of green, where the waster was as clear as crystal. Imagine a green jelly, where even the shadows cast by the pale green boulders are green but of deeper hue; as we advanced, light green mud rose knee high and then fell softly and gently into the profound greenness behind. So still, so silent, unmarked by the foot of man since the rive came into being, awe-inspiring, though not terrifying, it was like being in some mighty and invisible presence, whose only indication was the saturating greenness”. The 1935 explorations at Wookey Hole were curtailed by an access issue and then World War Two kept cave explorers from making further gains. After WW2. surplus oxygen rebreather equipment became available, enthusiasm and the number of divers increased. During the early 1940s, on a posting to Yorkshire, Balcombe found time to experiment with an oxygen rebreather respirator which he had built. He probed the rising at Keld Held several times, climbed down a ladder underwater at the bottom of Alum Pot, and pushed the sumps in Goyden Pot. As a solo diver, all his pre-war training and experiences on Mendip were strictly followed; this included bottom walking and carefully recording every moment, whether good or bad. This was a period of gestation that led directly to the formation of the Cave Diving Group. At the end of the war during Easter 1946, Graham Balcombe and Jack Sheppard held court at the Ffynnon Ddu resurgence in South Wales and, although failing to discover the great cave of OFD that lay waiting upstream, they succeeded in converting several cavers to the cause. Most came from the Bristol area, and so Wookey Hole Caves’ became the main focus of attention for the rest of the decade. Peak Cavern played a similar role in Derbyshire. Thus, the CDG was co-ordinated on a regional basis with Somerset, Welsh and Derbyshire sections. “HQ” was at Balcombe’s home in London. By 1949, the CDG had explored the subterranean Axe to the majestic Ninth Chamber and pushed beyond to the submerged Eleventh. Here the river wells up a steep slope at a point well below the depth limit of 9.1m for oxygen rebreathers. It marked the introduction of mixed gas rebreathers alongside oxygen rebreathers at Wookey Hole but Graham Balcombe’s influence remained strong through his authoritative chapter on cave diving in British Caving edited by Cecil Cullingford (1953). The availability of surplus War Department diving gear was a boon in the austerity years. Ex-WD equipment shaped all aspects of caving until the 1960s. National Service had a big impact upon cavers and cave diving in particular. Transport was difficult and time-consuming. The support of Sir Robert Davies and Gerard Hodgkinson, who had reached the rank of Wing Commander during the war, underwrote the strong links fostered between the CDG and Royal Navy. The ‘Wing Co’ encouraged the divers and provided them with a substantial wooden hut in the Wookey Hole car park which became known as Crooks’ Rest. It soon filled with diving gear. Wookey Hole once more became the focus of diving activities. In addition to exploration the early divers found a lot of archaeological material. As the divers penetrated deeper into the cave the need for a depth penetration below 30ft. (9 metres – at the time considered the safe limit of Oxygen diving), became more and more urgent, and the first attempt with an early aqualung nearly ended in tragedy. Swimming with fins in the manner of wartime frogmen and French divers was first considered in 1949. It was likely to be faster and stir up less mud. The steep descent in the Eleventh Chamber of Wookey Hole would probably be best attempted in this way. A highly experienced naval diver, Gordon Ingram-Marriott, was invited to demonstrate the technique. After visits to Wookey Hole and Peak Cavern in March, the dive to Eleven was arranged on the evening of 9th April. All the leading divers of the CDG were there. Somehow, on the return journey from the Tenth Chamber ahead of Robert E Davis, Marriott went missing in poor visibility. His body was subsequently found by Donald Coase just upstream of the Sixth Chamber. Desperate attempts to resuscitate him on the nearby diving platform in Six failed. He had run out of Oxygen and inexplicably lost his reserve cylinder. Wookey Hole Caves had claimed the first cave diving tragedy. It was a traumatic event for the CDG and Graham Balcombe in particular. The inquest concluded that a faulty test pressure gauge must have been responsible, but the divers were not so sure. Their uncertainty reinforced the old rule that aspiring cave divers should be cavers first and that the trusted routines, which included bottom walking, were intrinsically safer. A lull in pushing dives followed into the early 1950s. When Bob Davies became lost beyond the Eleventh Chamber whilst finning with an aqualung on 10th December 1955, and returned to tell of a remarkable escape from a Thirteenth Chamber that he had luckily chanced upon, the dice seemed loaded against swimming and breathing air in cave diving. For the rest of the 1950s, the divers, led by John Buxton and Oliver Wells, perfected the use of P-Party Oxygen/Nitrogen mixture re-breathers to increase depth potential. They preferred bottom walking and the longer duration of the re-breathers compensated for the necessarily slower but traditionally surer navigation on foot. Good progress was made to record depths of 21m in Wookey Hole Caves; the Swildon’s streamway was broken into beyond Sump Three and Sumps Four and Five were passed. The latter involved several mammoth expeditions, still some of the largest and most complex diving operations ever undertaken in Britain. Continue reading: CDG Cave Exploration – The Golden Age. From the 80's through to the present the CDG continue to lay line and discover new cave passage both in the UK and internationally. Cavers embrace the use of open circuit equipment, develop safety innovations and explore deeper and further into cave systems across the UK. Cave diving in the United Kingdom did not originate or develop in isolation from caving. Cavers learnt to dive; cave divers did not become cavers. © 1946 Copyright for use of any material submitted for use by this site remains with the originator. The CDG will facilitate contact to enable a copyright request to be made, as far as reasonably practicable.